This weekend we have Ironman Cozumel, the penultimate Ironman race of the year. 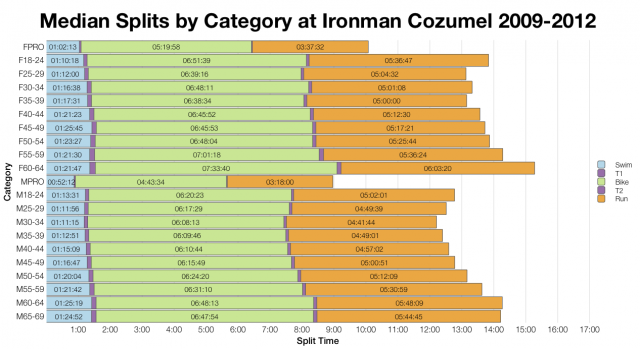 Cozumel is a pan flat course, but one that has been treated to tough, windy conditions on race day; it’s seen its share of slow swims, shortened swims and unusually high DNF rates over the past few year. It’s also seen its share of changes to the course and this year’s race will have a new and apparently faster swim course. Variable weather and changes to the course make it difficult to set expectations for this race, but that does’t stop me presenting the data. 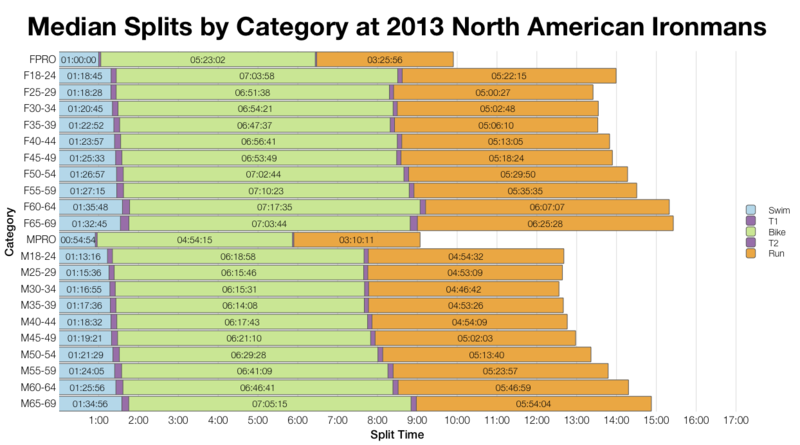 The 2013 race had a shortened swim so I’ve separated its results from the previous years of racing. The main comparison I’ll make is between 2009-2012 in Cozumel and 2013 results across North America. Although I’ve described Cozumel as – potentially – a tough event, comparing the medians above it’s actually quite close to the aggregated US results. If anything it looks to trend a little faster on the bike and particularly in the swim. 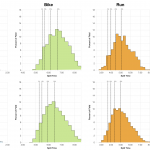 Comparing 2009-2012 with aggregated US results in distribution form suggests both bike and swim times trend faster in Cozumel. Sufficiently so that the Cozumel’s overall distribution looks to be around 15 minutes faster than is typical for North American races. 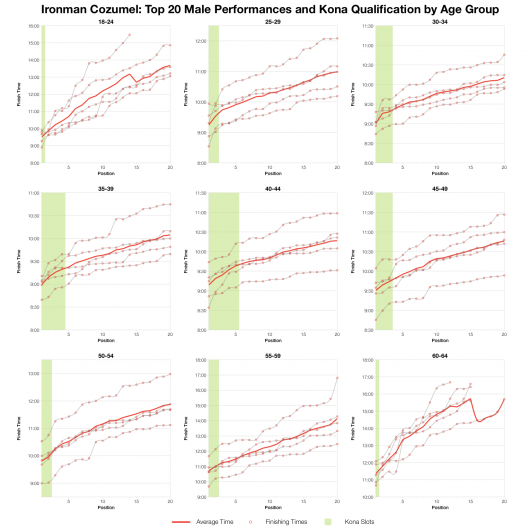 Ironman Cozumel has definitely seen tougher years, but average over the 5 years it’s been running and it comes out slightly ahead. The potential for fast racing, if conditions allow, is there. 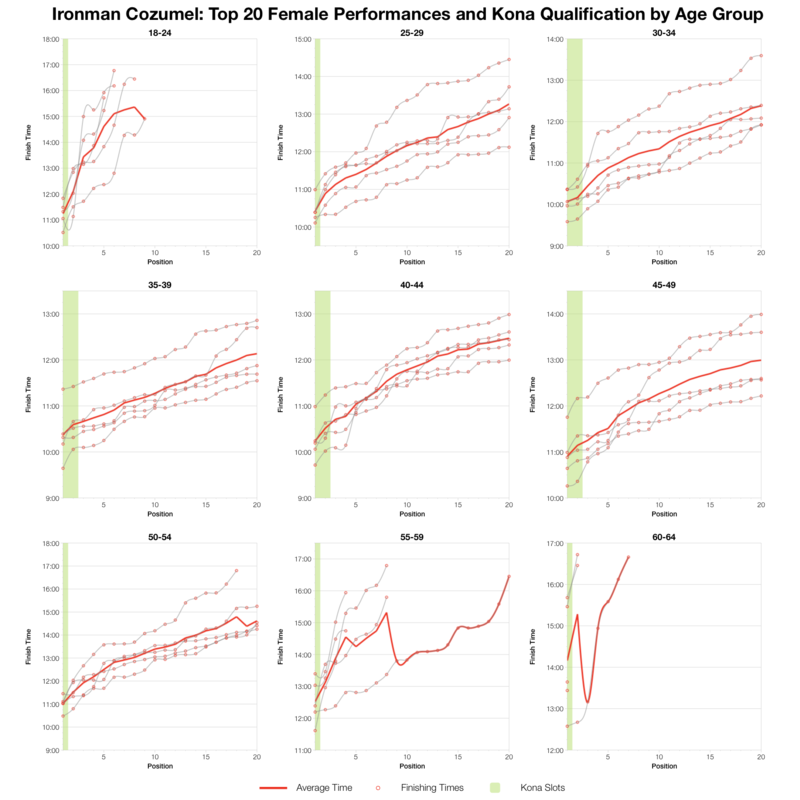 There are only 40 Kona slots available in Cozumel, the table above gives my estimates for the distribution of those slots based on the start list. Actual numbers wil vary on the day depending on start numbers. 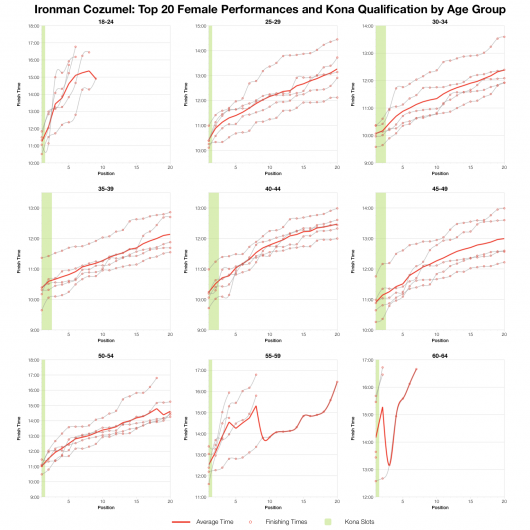 Probably the clearest indication of the impact of tough conditions is the huge spread in times for the top twenty age groupers over the last 5 years. 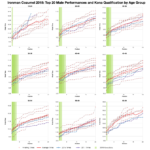 The trend from first through to twentieth has remained fairly consistent, but exactly how fast the athletes have been has varied by an hour or more in some age groups. 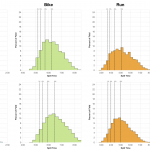 Predicting qualifying times is entirely dependent on race conditions and competition. 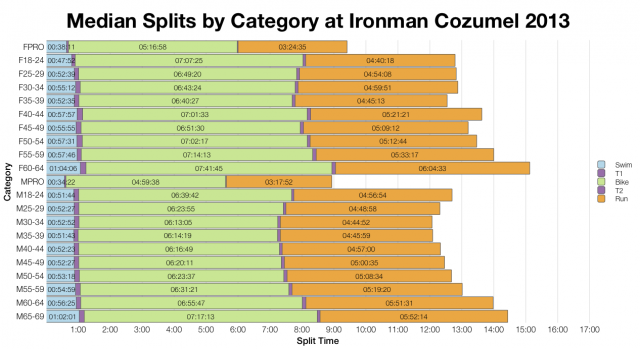 In the case of Ironman Cozumel conditions have varied a lot, but the competition has always been there. There’s a lot more detail for individual age groups in the PDF files below. Age group specific Ironman Cozumel results analysis – more charts and more detailed timings and splits for the top age groupers. 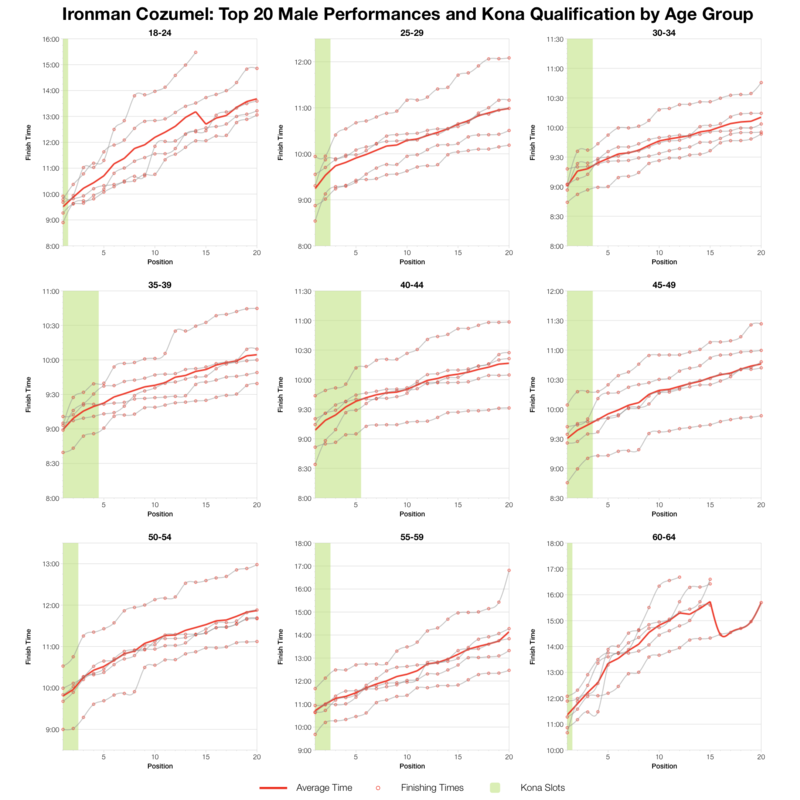 I wouldn’t like to guess at the kind of race we’ll see in Cozumel this weekend, I’ll report back on Monday with an analysis of the 2014 results.